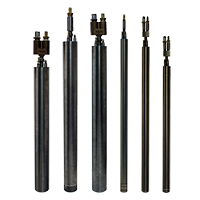 Pneumatic pumps for use in 4-inch and larger-diameter wells up to 200 ft. The SRX is an air-powered pump used to extract leachate or gas condensate at variable rates equal to the well recharge. Pump flow rates are up to 9.5 gpm and temperatures up to 250°F. In wells under vacuum with the pump exhaust vented outside the well seal, the SRX pump can maintain the normal draw-down level when the air-exhaust line is equipped with the optional “E”-valve (part # TR-697) located below the well seal. See an illustration showing how simple it is to disassemble the SRX LP.